Like many other East Villagers I was sad to see Nice Guy Eddies close. The KISS mural outside was a bit of a neighborhood landmark, the food wasn’t the best (I was a fan of the wings) and the place was pretty dingy, but it was a chill place to get a beer & watch some sports. Neighborhoods change so I figured that a cocktail bar or an upscale restaurant would move in and that I’d hate it, not so with Boulton & Watt. As soon as you walk in, you’ll notice that gone is the dive sports bar decor in favor of a much more industrial look (steampunk anyone?) with belt driven fans as well as exposed brick and duct work. 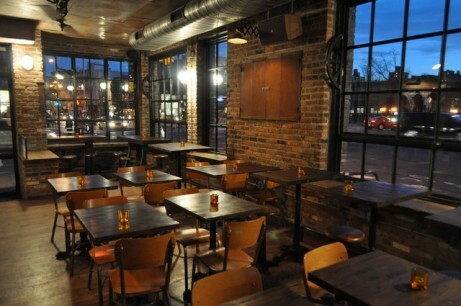 Gothamist calls it ‘old timey‘, I’m not sure if I’d agree with that, but I do think the place looks great. Before I get onto the food, I’d like to note that I was invited by the restaurant’s PR firm & I did NOT pay for my meal. I’ve only done this a few times before & I’ve always made sure to mention this fact in my posts & it in no way influences my review. 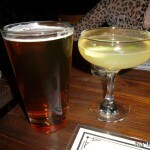 We started with a few drinks; there are nine signature cocktails, ten beers on tap (ranging from 14-64 oz), several bottled beers & an extensive wine list. The first thing that caught my eye was the Steak Tartare. I never thought I’d say this, but this is the best steak tartare I’ve ever had. The hand cut beef topped with an organic egg was perfectly seasoned. Honestly, if you’re a tartare fan, this dish alone is well worth the trip. We also ordered a special appetizer, a soft cheese with pistachio & citrus honey. It was good, but really didn’t match up to the tartare. 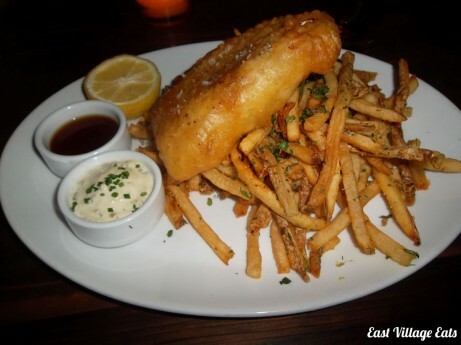 For my entree, I chose the Day Boat Battered Cod which I enjoyed. The fish was fried well, flaky & not overly greasy, but I thought that there were way too much fries on the plate (this might, in fact, be a bonus for some). 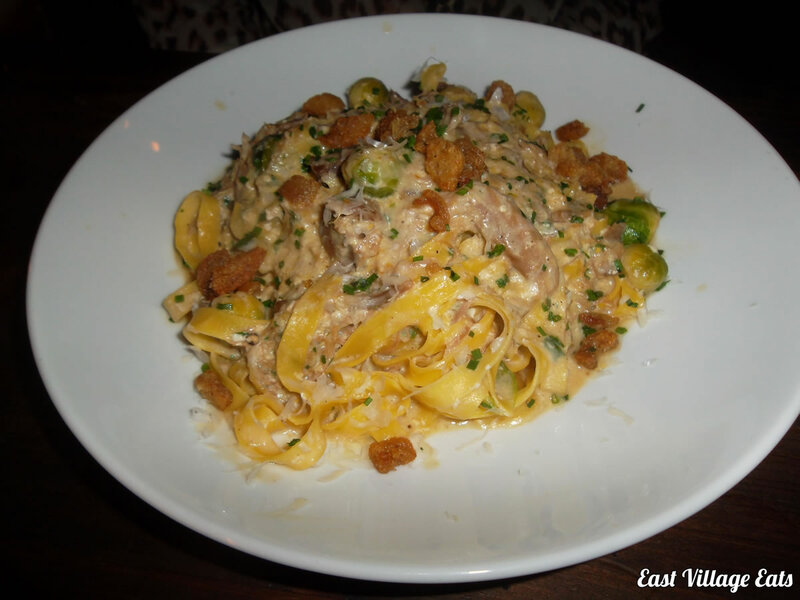 The only problem in the meal came from the Duck Confit Carbonara. I’m sure that this sounded like a great idea on paper, but what arrived was insanely oily & basically inedible. We both agreed that there was just something not right about the dish. In hindsight, we should have ordered the Blackened Brick Chicken which comes highly recommended. 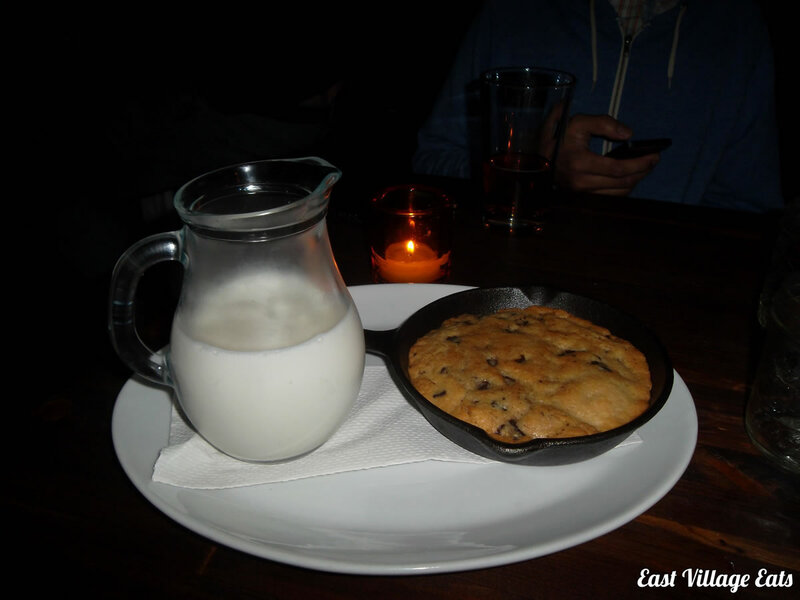 Obviously we felt the need to enjoy some dessert & correctly opted for the Cast-Iron Chocolate Chip Cookie. Meant to serve 4 & accompanied by a pitcher of milk, this was a great end to the meal. A sweet, melted chocolate mess (in a good way) that smelled amazing. 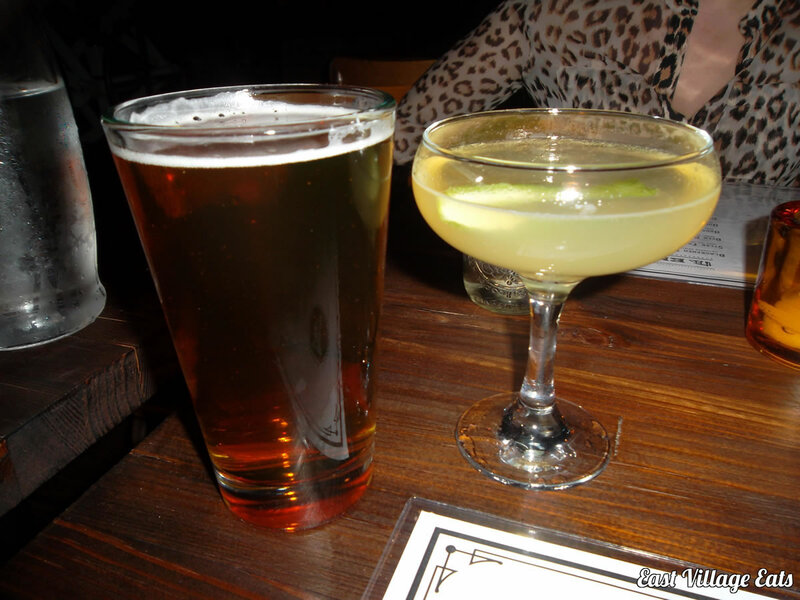 Despite the one flawed dish, I had a good time at Boulton & Watt. 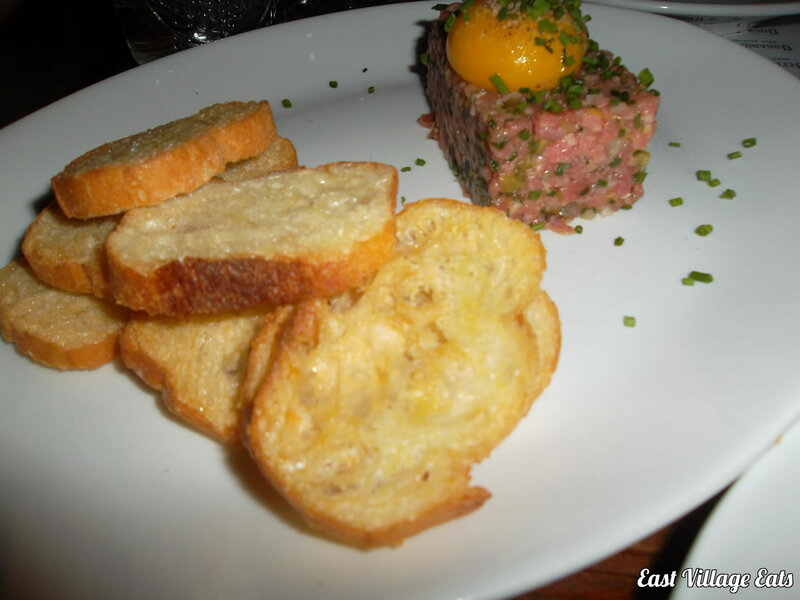 The place looks great, I was blown away by the steak tartare and the service was excellent. Boulton & Watt: 5 Avenue A at Houston St.